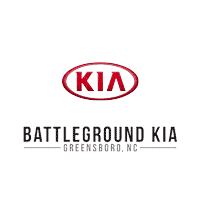 Battleground Kia, a Kia dealer in Greensboro, NC was built with one mission – Provide amenities to guarantee customer satisfaction before, during, and after the sale of our great cars, trucks, and SUVS. Battleground Kia is one of the premier Kia dealers in the U.S. Our commitment to customer service is second to none. We offer one of the most comprehensive Kia parts and Kia service departments in the Carolinas. Please feel free to call us or send us an email using the Contact Us page. We look forward to meeting our new friends at Battleground Kia. In today’s world, words like “quality” and “trust” get thrown around like yesterday’s newspaper. But at Battleground Kia, we believe in integrity and giving the customer a good value for their hard-earned money. So stop by and give us a chance to share our experience and inventory with you in a no-hassle, state of the art auto environment. At Battleground Kia, we hold strong to our purpose, vision, mission, and values and we hope to have you as a valued customer soon! Improving Lives of our Customers, Associates and Stakeholders! To Identify, Attract and Develop Top Performers.